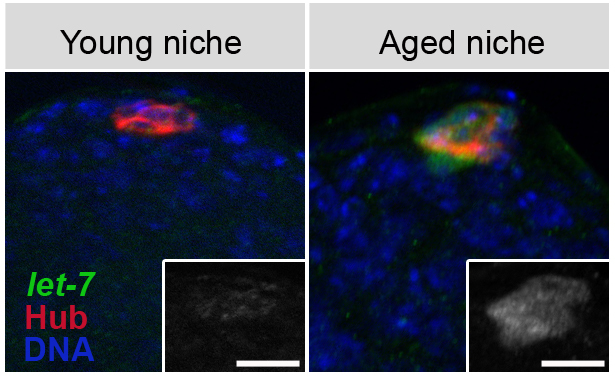 Researchers at the Salk Institute for Biological Studies have uncovered a series of biological events that implicate stem cells’ “niche” (surroundings) as the culprit in loss of stem cells due to aging. Their findings have implications for treatment of age-related diseases and for the effectiveness of regenerative medicine. Stem cells are essential building blocks for all organisms, from plants to humans. They can divide and renew themselves throughout life, differentiating into the specialized tissues needed during development, as well as cells necessary to repair adult tissue. So because they recreate themselves and regenerate tissues throughout a person’s lifetime, they can be considered “immortal.” But that doesn’t mean they don’t age. They do, gradually losing their ability to effectively maintain tissues and organs. Stem cells reside within a microenvironment of other cells — the niche — that is known to play a role in stem cell function. For example, after a tissue is injured, the niche signals to stem cells to form new tissue. It is believed that stem cells and their niche send signals to each other to help maintain their potency over a lifetime. “The findings suggest, for example, that putting new or young stem cells into an old environment—that of an aged patient—might not lead to the best outcome in tissue regeneration,” says the study’s senior investigator, Leanne Jones, associate professor in Salk’s Laboratory of Genetics. 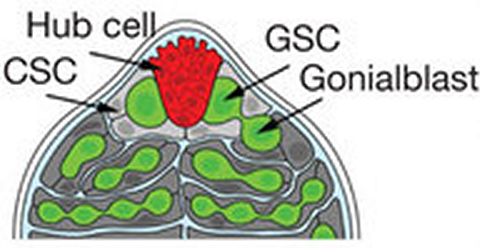 The stem-cell niche in the Drosophila testis is located at the apical tip, where both germline stem cells (GSCs) and somatic cyst stem cells (CSCs) are in direct contact with protective hub cells. Aging results in progressive decrease in levels of the self-renewal factor Upd, expressed in hub cells. Expression of upd in hub cells was sufficient to block the age-related loss of GSC. But while the loss of tissue and organ function during aging has been attributed to decreases in stem cell function, it has been unclear how this decline occurs. Jones’ lab has been investigating a number of possible scenarios, such as whether the loss of tissue function is due to a decrease in the number of stem cells, to the inability of stem cells to respond to signals from their niche, or to reduced signaling from the niche. To explore stem cell aging, Jones uses cells found in the testes of the male fruit fly, Drosophila melanogaster, which are remarkably similar to those found in humans. The researchers show how signals from the niche that act to maintain the vitality of the flies’ stem cells are lost over time, leading to a decline in the number of stem cells available to maintain the tissue. They also show that restoring those signals revitalizes the cells. “Stem cell behavior is similar between flies and humans, so our findings have major implications for breakthroughs in using tissue stem cells to treat age-related tissue decline or regeneration after an injury,” says one of the paper’s first authors, Hila Toledano, a former Salk investigator who is now at the University of Haifa in Israel. The Salk researchers discovered that as the stem cell niche ages, the cells produce a microRNA (a molecule that plays a negative role in the production of proteins from RNA) known as let-7. This microRNA is known to exist in a number of species, including humans, and helps time events that occur during development. This increase in let-7 leads to a domino effect that flips a switch on aging by influencing a protein known as Imp, whose function is to protect another molecule, Upd, which is secreted from a key area of the niche. In short, Upd promotes the signaling that keeps stem cells active and in contact with the niche so that they can self-renew. And as aging advances, increasing expression of let-7 ultimately leads to lower Upd levels, decreasing the number of active stem cells in the niche. What leads to accumulation of let-7 in the niche of aged flies still remains an open question. The researchers also demonstrated they could reverse this age-related loss of stem cells by increasing expression of Imp. “We turned the aging switch off,” says Jones. This antidote to aging might be accomplished in a number of ways, such as by preventing let-7 from being elevated, blocking the destruction of Upd or increase the expression of Imp. “This research opens new avenues for drug development aimed at stimulating a patient’s own stem cells to overcome the consequences of aging,” says Toledano. Jones says the study uncovered a mechanism by which a niche can lose its supportive function and demonstrates this can be reversed. “In patients, this could include co-transplantation of components of the niche itself, or rejuvenation of the niche using drug therapy to support the transplanted stem cells,” says Jones. Co-authors include Cecilia D’Alterio, from the Laboratory of Genetics at Salk, Benjamin Czech, from the Howard Hughes Medical Institute and Cold Spring Harbor Laboratory, and Erel Levine, from Harvard University.